What's the harmonic major scale? The harmonic major scale aka Ionian b6 mode is built the same way as the diatonic major scale, but with a lowered 6th. It can also be considered as the harmonic minor scale with a raised third. The Ionian b6 mode is not very well-known but can be very intersting to add more exotic feel to your jazz improvisations. It is generally played over a major 7 chord even it's difficult to use because it sounds a little bit weird and dissonant. As it shown in the chart below, the harmonic major scale interval pattern is W - W - H - W - H - WH - H giving the formula : 1 (root) - 2 (second) - 3 (third) - 4 (fourth) - 5 (fifth) - b6 (minor sixth) - 7 (seventh). The harmonic minor scale is sometimes reffered to as Ethiopian scale or Nat Bhairav (Indian scale). You see that the harmonic major scale has a b6 instead of a 6 in the major scale. You see that harmonic minor scale has a b3 whereas the harmonic major scale has a major third (3). 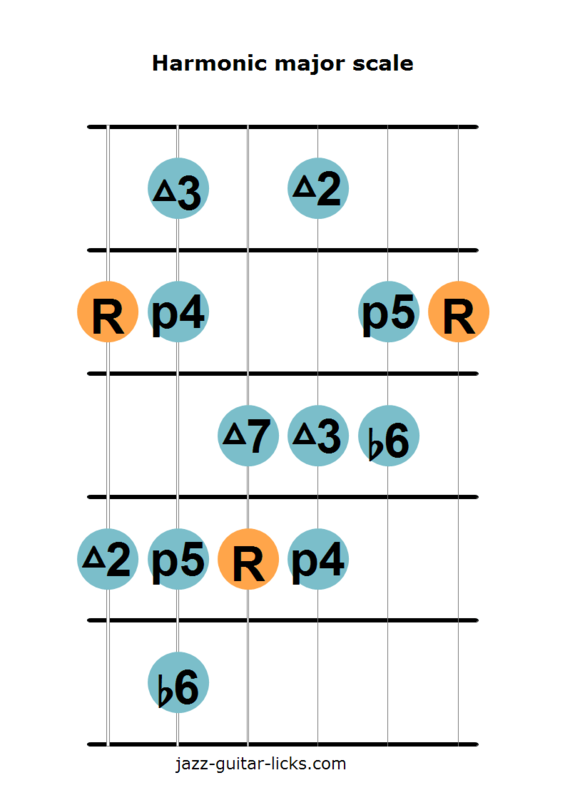 There are four types of triads in the harmonic major scale. Two major triads (degrees I and V). Two minor triads (degrees III and IV), one augmented triad (sixth degree) and two diminished triads on the second and seventh degree. 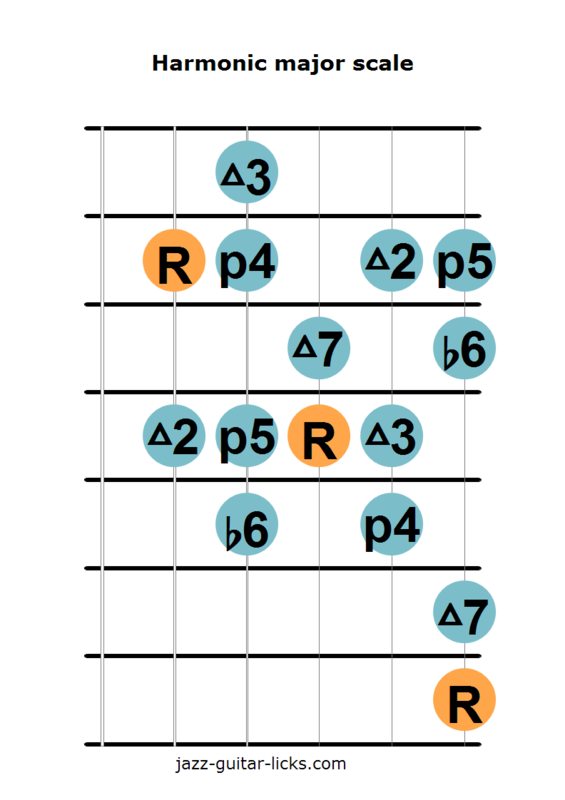 When stacking thirds on each degree of the harmonic major scale we get seven chords. These chords can be extended with a 9, 11 or 13 and arpeggiate in order to create interesting jazz lines. The two guitar shapes below show you how to play the harmonic major scale on guitar. The first diagram has roots on the sixth, fourth and first string, whereas the second diagram on the right has roots on the fifth and second string. 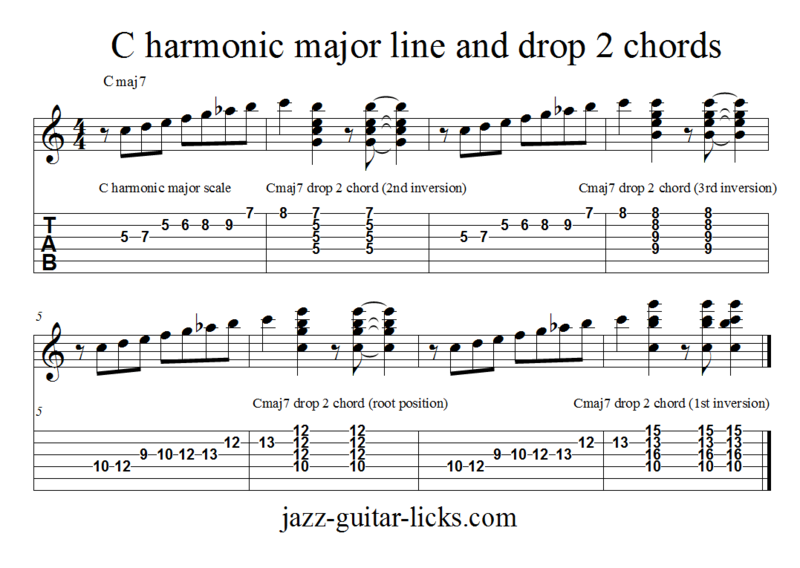 This short exercise consist in playing a repetitive C harmonic major line with four drop 2 C major 7 chords.